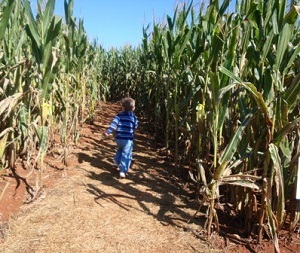 Looking for a local corn maze or hayride in Northwest Arizona? Scroll down this page and you will see the all of thoses in Northwest Arizona, sorted by county. Some are huge corn mazes with hayrides, pumpkins, corn cannons, inflatables and others are simple corn mazes with little else. Most also have loads of pumpkins to choose from. To really make it fun for your kids, look for those that have the extra activities, like a corn cannon, cow train, inflatables, farm animals, pumpkin patch or zip lines. There is usually a small fee for the mazes (of course, the more elaborate mazes tend to charge more. Hayrides are often free. ALWAYS call before you go to confirm the info, they don't always report changes to me! 6701 East Mountain Ranch Road, Williams, AZ 86046. Phone: 928-635-0706. Open: April through December 17 - weather permitting. See beautiful Northern Arizona high country on horseback. Expert guides will take you into the tall, quiet pines of Kaibab National Forest, where you may see a variety of wildlife, including elk and deer. We provide an experienced horse perfectly matched for every riding level, so you can sit back, relax, and relive the Old West they way it was meant to be... on horseback! All-day rides are available. Call for an appointment and pricing. We accept Visa, Master Card, American Express, and Discover. Some weight & age restrictions may apply.